Pastor Yolanda Douthit is a natural born teacher that allows her vulnerability and transparency to encourage you to live your most abundant life! Take some time to hear her heart thru some of her dynamic teachings and interviews. Then discover how she can encourage or mentor you. Visit our YouTube channel to view more teachings. Get updated on new teachings, blogs v-logs and speaking engagements. Subscribe to my newsletter. The #FatalAttractionSeries has been one of my most impactful teachings yet! It's equipping the destiny driven Believer to WIN! This V-log documents and exposes the fatal spirits in and out of the church that are on assignment to keep you from living the purposeful life that has been ordained from you. Listen in as I expose the LAST fatal spirit in this series, the "Easily Offended." The #FatalAttractionSeries as it touching the lives of those who are ready to WIN and live in their God given destiny! This V-log documents and exposes the fatal spirits in and out of the church that are on assignment to keep you from living the purposeful life that has been ordained from you. I dig deep, sharing my personal experiences with these deceptive and deceiving spirits while providing tools to be victorious as I have been! Tune in as the "Undercover User" is exposed! It will open your eyes to these life suckers and prepare you for the good life! The #FatalAttractionSeries V-log documents and exposes the fatal spirits in and out of the church that are on assignment to keep you from living the purposeful life that has been ordained from you. I dig deep, sharing my personal experiences with these deceptive and deceiving spirits while providing you with tools to be victorious as I have been! Listen in as I expose the fourth spirit "Double Talking Discourager." The Periscope Pews requested it and I am bringing it! I am excited to announce my new, #FatalAttraction VLog on Wednesday's at 8;30 pm (eastern). This VLog will document and expose the fatal spirits in and out of the church that are on assignment to keep you from living the purposeful life that has been ordained from you. I dig deep, sharing my personal experiences with these deceptive and deceiving spirits while providing you with tools to be victorious as I have been! Join me as I expose the second spirit the "#DemonicDecepticon" It will prepare you to #WIN over the many faces of this fatal spirit! Pastor Yolanda Kelty Douthit is in the last week of the good biblical teaching on The Power of One: Destiny Driven. There is only one more worship service remaining in this life altering teaching that is designed to empower you to use the gifts and talents that have been freely given to you for His purposes. These teachings have equipped the saints to operate in the gifts that are freely bestowed upon each of us. A person that's driven to live out destiny understands their niche and focuses on achieving it. The person of destiny has a clear mental picture of what God created them to do and good understanding of the strategies required to execute them, and will do what's necessary to bring their God vision to pass. The person of destiny will glory in the purported problem of the enemy and take their destiny by force. Do you know your gift? And if you do know your gift do you have the wisdom to operate in it; can you work the plan to manifest it into reality? If you need answers to these questions meet me on Sunday as the Spirit will provide revelation on how "The Violent Take Their Destiny By Force." Pastor Yolanda Kelty Douthit continues the good biblical teaching on The Power of One: Destiny Driven. This life altering teaching is designed to empower one to use the gifts and talents that have been freely given to you for His purposes. We are accountable for the knowledge, resources, abilities that God has blessed us with. If we have been given much, then He expects that much more from us. The good news is that all of these blessings come from the Lord and He realizes that humans are not perfect and that we can't do anything right without His help and we can only do these things through Him. In this dynamic teaching you will learn the real meaning behind, "To Whom Much Is Given." Pastor Yolanda Kelty Douthit continues the good biblical teaching on The Power of One: Destiny Driven. This teaching is designed to prepare you to live the preordained and fulfilled life created for them at the foundation of the earth. And to live it will require “shifting seasons.”God has good plans for us in 2017. He wants to shift us out of what has held us back from His best and into His good, perfect and acceptable will (Rom. 12:2). But it’s clear that we must create a climate to bring transformation to our spiritual climate - its sets the stage for a shift in spiritual seasons. And we can’t shift our seasons, only the Spirit of God can do that, our part is to position ourselves and hearts for the shift—and that means creating climate that sets the stage for God to move in our lives. So "When the Fire Moves We Move.” Don’t know how to do it, listen as she gives you your keys to shift. Pastor Yolanda resumes the good biblical teaching on The Power of One: Destiny Driven. This teaching is designed to prepare you to live the preordained and fulfilled life created for them at the foundation of the earth. Unfortunately, this is not a child’s play and with all the drama and problems in our lives, we could possibly live our the ordained plan. But that lie is meant to keep you paralyzed in doubt and fear. Enter into the Virtual Tabernacle to learn how to have "#NoMoreDrama." Pastor Yolanda Kelty Douthit​ continues the good biblical teaching on The Power of One: Destiny Driven. This teaching is designed to prepare you to live the preordained and fulfilled life created for them at the foundation of the earth. But many of us feel that with all the drama and chaos in our lives how in the world can we live out the plans and visions we so desperately want to see come to life. It all the elements of drama, ranging from the deepest sorrow to the greatest exultation, it is the story of faith and hope during years of trouble, and the story of success and joy that our Intelligent Designer will use to create a life fulfilled. Don't believe, enter into the Virtual Tabernacle to see how you can move from "Drama….To Destiny." Pastor Yolanda continues the teaching on The Power of One: Destiny Driven. This teaching is designed to prepare you to live the preordained and fulfilled life created for them at the foundation of the earth. He has a gift and calling you are to fulfill and this teaching will open your eyes to the joy, security, and satisfaction of living in destiny. You may have a divine message, subject, or product which God specially and specifically implanted in you to help you announce yourself to your generation. But you aren't equipped emotionally, mentally, or physically to live out the calling? This message will shine a light on the pathway to healing every place you hurt to bring out the goodness that lies within you so that you can prosper and be in good health as you live out your destiny. It will #GetYourWholeEntireLife as #GoodHealthIsWealth. Pastor Yolanda Kelty Douthit is resumes the good biblical teaching on The Power of One: Destiny Driven. This teaching is designed to prepare you to live the preordained and fulfilled life created for them at the foundation of the earth. He has a gift and calling you are to fulfill and this teaching will open your eyes to the joy, security and satisfaction of living in destiny. You may have a divine message, subject, or product which God specially and specifically implanted in you to help you announce yourself to your generation. But you aren't equipped emotionally, mentally, or physically to live out the calling? This teaching will shine a light on the pathway to all the goodness that lies within you thru your destiny to launch you into real success, wealth, and good health so that your soul and your body are good. It will #GetYouBodied. Pastor Yolanda serves to God's people a biblical teaching on pursuing destiny so that they can live the preordained and fulfilled life created for them at the foundation of the earth. This teaching is designed to prepare you to live the preordained and fulfilled life created for them at the foundation of the earth even when you feel as though you are living "Destiny Interrupted." This word is what you need to break into your destiny. Our Father has a plan for you to fulfill and this teaching will release a force known as wisdom to interrupt the plans of the enemy! Yolanda Kelty Douthit is serving God’s people a good biblical teaching on The Power of One: Destiny Driven, so that they can live the preordained and fulfilled life created for them at the foundation of the earth. But oftentimes our need to dominate and be in control of every aspect of our life hinders us from flowing freely within the preordained plan. He has plan for you to fulfill and in our study tonight we will learn how its necessary to "Lose Control" so that we can live joyfully in it. Pastor Yolanda serves God’s people a biblical teaching The Power of One: Destiny Driven so that they can live the preordained and fulfilled life created for them at the foundation of the earth. But many times they can’t because they are caught up in the  “Trap House: The Den of Discouragement and Distractions. If you have been seeking to get out of the trophies and on track to a purposeful and fulfilled life, you will find direction in this teaching series on to identify destiny destroyers, helpers, and the traps of the traphouse. Listen as Pastor Yolanda continue thru the Book of Joshua. Here we hit a significant point in our study thru the Book of Joshua. This teaching will reveal how our "Father's Will Is Your Will." Pastor Yolanda serves a good biblical teaching on The Power of One: Destiny Driven in our Sunday For Your Soul Worship. This teaching is designed to prepare you to live the preordained and fulfilled life created for you at the foundation of the earth even when you feel as though you are living "Destiny Interrupted. This Word will address the dysfunctional DNA many encounter that hinders one from living in the fullness of the Fathers plan. Join us in The Tabernacle to get practical wisdom that will interrupt and destroy the generational weapons of the enemy! Pastor Yolanda serves God’s people a good biblical teaching on The Power of One: Destiny Driven, so that they can live the preordained and fulfilled life created for them at the foundation of the earth. But oftentimes our need to dominate and be in control of every aspect of our life hinders us from flowing freely within the preordained plan. He has plan for you to fulfill and in our teaching on Sunday she will teach how "Rest in God's Sovereignty" we will experience the happiness, security, and satisfaction that we desire. This teaching will encourage you in the midst of your unique situations, overwhelming challenges, and difficulties that you may have "99 Problems but the Power to Overcome is not One of Them." Pastor Yolanda will encourage and illuminate your mind to the strategy of "Being Straight Vigilant" thru the Book of Joshua. It's a sure fire plan that will produce Victory in 2017. In these times knowing God, His Gods power, and is Gods promises are imperative. But you can command the "Moon to Stand Still" to receive the "Grace to Win." This teaching will give you the "Seed of Strategy" to be victorious over life strongholds. Take time to listen. ​Listen to an empowering word that will deliver you from the "Valley of Trouble." Pastor Yolanda serves a message that will open your eyes to "Discern Decepticons" and will transform it to your advantage. This teaching will open your eyes of understanding to the limitless life promised to you. It will take boundaries off of your life. It a message of "No More Caps." Pastor Yolanda is on Facebook Live serving a teaching that will inspire you to "Live in Victory in 2017." 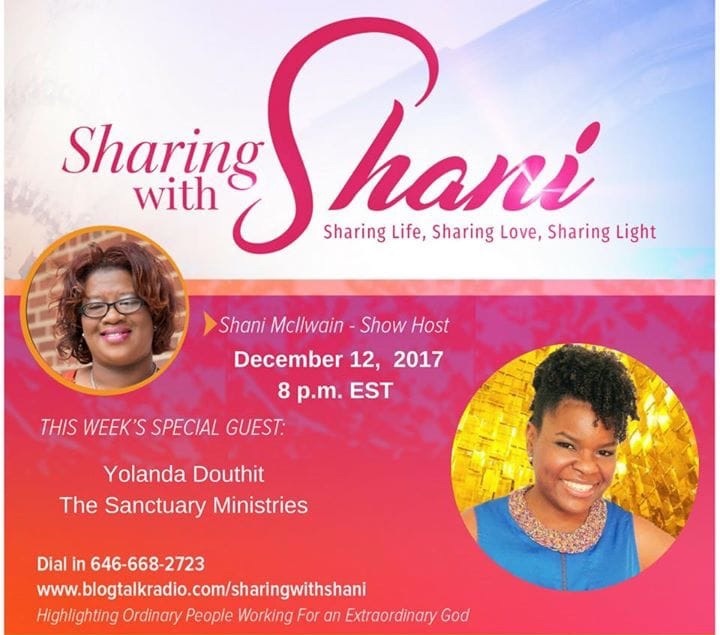 Listen to Pastor Yolanda share about the extraordinary work our Father is doing with ordinary with Shani via Blog Talk Radio. Feed your soul with a message that Pastor Yolanda Kelty Douthit ministered at her mother Pastor-Rosa Marion church, Beauty for Ashes in Charlotte, NC . It is a message that will turn your life. To learn more about Pastor Yolanda mentorship or encouragement sessions or how you can get her to speak at your next event, click one of the links below.